8" touchscreen display with pinch-to-zoom and other multi-touch controls. 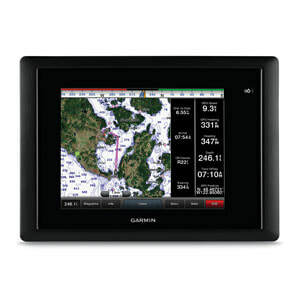 Multi-touch Glass Helm Display: The bright SVGA touchscreen comes standard with a worldwide, satellite-enhanced basemap and includes pinch-to-zoom and other touch controls for intuitive operation. Anti-glare and LED backlighting makes it easy to view in bright sunlight. And auto-dimming provides outstanding visibility at night. Full System Integration: GPSMAP 8008 integrates various sonar technologies as well as autopilot, connectivity, apps, engine data and multi-media. User data can be automatically synced for all networked 8000 series chartplotters across multiple helms — everything you need is at your fingertips, all on one screen. A full digital switching system uses CZone technology. You can power up your boat while away from the dock; switch on pumps; and control lights, even underwater lights. Nearly all of your controls are available right at your fingertips either at the helm, or programmed into a remote key fob, or an app on your tablet provided by CZone by Mastervolt. Advantages of CHIRP Technology: When used with the GSD 26 CHIRP professional sonar module (sold separately), GPSMAP 8008 displays crystal-clear sonar images to help find the next hidden fishing spot, ship wreckage or diving location. Garmin CHIRP sonar allows you to see target separation and resolution at extraordinary depths, and dial into specific frequencies to target certain species of sport fish. Bottom contours are more visible, and signal noise can be suppressed at greater depths to provide a more timely interpretation of what’s below for safer navigation and better fishing. ​FUSION-Link Entertainment System: Enjoy the ability to control all compatible FUSION-Link-enabled audio systems directly from your compatible chartplotter display. Free Garmin Helm App: Garmin Helm allows you to view and control your compatible Garmin chartplotter from an iPhone or iPad, or phone or tablet using Android — while providing enhanced situational awareness for the mariner. Easily switch between portrait and landscape mode to accommodate mounting preferences. Using your iPhone or iPad, you can even record a movie of your chartplotter screen to share with friends and family. Download from the App Store™ or Google Play™ today (requires Garmin Marine Wi-Fi Adapter Kit sold separately). Flexible Mounting Options: The 8008 MFD is compatible with the traditional bail mount, or you can step up to the low-profile flush mount. For the ultimate in custom appearance, check out our exclusive flat-mount glass helm option.